Even for jaded football fans, it's been a wild week in the world of NFL drug testing. The league banned Buccaneers cornerback Eric Wright and Patriots defensive end Jermaine Cunningham on Monday for four games for violating the NFL's policy on performance-enhancing drugs. Two others - standout cornerbacks Richard Sherman and Brandon Browner of the Seattle Seahawks - learned they could be facing suspensions for the same transgression. However, none of these players were linked to anabolic steroids, human growth hormone or illicit narcotics. Their apparent banned substance of choice was Adderall - a stimulant best known for treating attention deficit hyperactivity disorder (ADHD). CBSSports.com learned that Sherman and Browner both tested positive for an amphetamine, which was reported to be Adderall. A league source told the Boston Globe that Cunningham tested positive for the same stimulant. As for Wright, he explicitly said his suspension was the result of taking Adderallin July "for health issues." These players are not the first to cite Adderall as the drug behind a suspension. Buccaneers cornerback Aqib Talib (now with the Patriots) admitted "taking an Adderall pill without a prescription" and Browns cornerback Joe Haden apologized last month for taking the stimulant, calling it a "dumb mistake." Some suspended players, like Giants safety Tyler Sash, have said they had no idea the league considered the drug out of bounds. But Adderall is clearly listed on the NFL's list of banned substances - lumped in the same amphetamine category as "greenies" and "speed" on the players' association website. NFL spokesman Greg Aiello told CBSNews.com that the league regards Adderall as a "game-day performance enhancer." But can the stimulant actually give a player a tangible edge on the field? Yes, according to experts. Adderall essentially "makes you more aware and more attentive," says Andrew Spanswick, an addiction specialist who has helped rehabilitate professional athletes with Adderall addiction at his Los Angeles treatment center. "It makes you feel more calm and more alert and makes things go slower, which is perfect for an NFL player," said Spanswick, who added that Adderall could theoretically give NFL defenders a split second jump on the ball. Dr. Eric Morse, a Raleigh, N.C., sports psychiatrist, said stimulants like Adderall can even reduce pain sensation. "You're more likely to push through an injury or bump or bruise," he said. Adderall won't make you smarter but it will keep you working longer with a heightened sense of concentration. When one considers NFL players must absorb tomes of information on a weekly basis - all while recovering from a physical beating from the previous game - it is perhaps no surprise that players would turn to Adderall for an edge. At least 10 players - most of them defenders - have publicly admitted to using the drug since the beginning of last season. Morse said he's not surprised that Adderall has become especially prevalent among defensive backs. "You have to maintain different levels of attention in the secondary, you have to watch the quarterback and the wide receiver that you're guarding," he said. Although the league does not disclose positive drug test tallies for specific substances, Adolpho Birch, the NFL senior vice president of law and labor, did acknowledge on Wednesday that there has been a rise in amphetamine usage. "It's not a secret that it's a societal trend," Birch said. "We are starting to see some effects of that within our league." It's noteworthy that Adderall, which has been on the NFL's list of banned substances since 2006, is only now making headlines given the league's stringent drug-testing policies. Players can be tested half a dozen times during the offseason and 10 players on each team are subject to random game-day testing during the regular season and playoffs. Prior offenders are tested even more frequently. 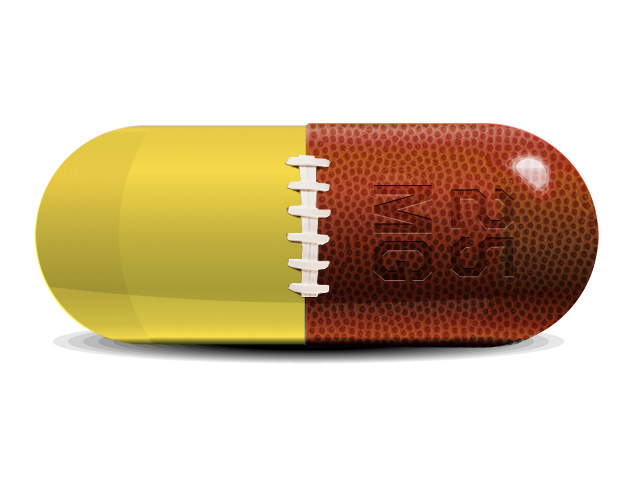 The prevalence of Adderall in the NFL has corresponded with its popularity on college campuses, where it is a coveted study aid. Spanswick said about 25 percent of all students are using Adderall at least once a year (legally and illegally) and pills can fetch up to $25 during exam weeks. He added that the medication is liberally prescribed to children in neighborhoods lacking alternative therapies - and many NFL players grow up in these poorer communities. Morse says about 5-8 percent of the general population has ADHD but that percentage doubles for athletes, in part because students who don't excel in the classroom naturally gravitate toward sports. Adderall may provide a competitive edge but it comes with serious health risks. The stimulant is very addictive and an overdose could result in a drug-induced psychosis or even cardiac arrest. Spanswick noted that abusing Adderall could lead someone to lose touch with reality and have suicidal or delusional thoughts. The FDA classifies Adderall as a Schedule II drug, meaning it has a high potential for abuse. (Drugs like cocaine and morphine are also Schedule II drugs). The NFL says players who need Adderall for medical reasons (like ADHD) can do so if they apply for a therapeutic use exemption in advance. The league did not disclose how many players have such applied for such waivers, so it is unclear how many take the drug under a doctor's supervision and how many ingest it for an illicit pick-me-up. Further muddying the waters on the apparent prevalence of Adderall is the NFL's silence on what triggers suspensions. The league will simply state a player has been banned for "violating the NFL's policy on performance-enhancing substances." Only the player - if he chooses - can disclose the substance in question. Players like Wright, Talib and Haden can publicly blame Adderall for their respective bans but there is no way to verify the actual medicinal culprit. A common prescription drug, of course, is more socially acceptable than something like human growth hormone. So it would be no surprise if players banned for violating the NFL drug policy would more willing to cite a stimulant over a steroid. Indeed, former NFL defensive end Ryan Riddle said he thinks that Adderall is being used as a cover-up by players caught using other performance-enhancing drugs, calling it a "PR excuse." Even Morse, who works with professional and college athletes, acknowledged that he would be tempted to blame a stimulant if he tested positive for steroids. "If I were a player and got caught taking something else like steroids, I'd want to protect my reputation and my ability to endorse products," he said. "Saying it's just Adderall would reduce the stigma of testing positive." Meanwhile coaches are left to hope their players make the right decision when it comes to the stimulant. Tampa Bay head coach Greg Schiano said he doesn't feel there's a problem with Adderall on the Buccaneers - even though two players on his watch have been banned this season for allegedly using the drug. "This is a widespread issue throughout the National Football League right now. It's certainly not Tampa-exclusive," Schiano said earlier this week. "We educate our guys, we talk to them about it quite a bit," the coach added. "You do your best, then you've got to trust the guys that you brought here. ... It's like raising kids. It's never going to be 100 percent. That's for sure. But you do your best."